This is the 58th in a series of articles analyzing major companies traded on the tech-heavy Kosdaq market. -- Ed. Aurora World Corporation, the South Korean plush toy manufacturer and supplier most-known for its global toy line “YooHoo & Friends,” is anticipating a leap forward in the second half of this year. A three-dimensional version of YooHoo & Friends computer-animated television adaption targeting 4 to 8-year-olds is set to be streamed through Netflix in the second half. Analysts here said it would gradually appeal to viewers in 190 nations in 20 languages and contribute to the company‘s income through intellectual property rights. In addition, the company has materialized plans for business expansion in China, through licensing animated characters and building a theme park. The stock price of Aurora World, trading on the second-tier Kosdaq, has room for a rebound in the second half that would offset weak stock performance in the first half, analysts said. As of Friday, Aurora World’s market cap came to 115.2 billion won ($103.1 million), a 536th-largest in the market out of some 1,200 listed companies. Its share was trading at 10,700 won in Friday closing. Since hitting a 52-week-high at 13,850 won in April, Aurora World stock price has been on a downward move. In the past 20 trading days, Aurora World dipped 12.7 percent. Some 2.4 percent of shares is owned by foreign investors as of Friday. Since 2017, YooHoo & Friends season 1 and season 2 began to be distributed on Netflix, a global video streaming service provider, helping the animation TV show reach out to viewers of 190 nations, from 60 nations prior to Netflix deal. But the momentum on Aurora World earnings through Netflix audience will start to build from the second half, Yi Byung-hwa, an analyst at KB Securities, wrote in a note, on expectation for the next season will be called “YooHoo to the Rescue,” a 3-D version produced in cooperation with Mondo TV. In addition, Aurora World announced on June 22 it had signed a memorandum of understanding with Qingdao Publishing Group to publish YooHoo & Friends storybooks in some 14,000 bookstores affiliated to the group, as well as open a theme park through a joint venture with China‘s state-owned publisher by the second half of this year. “More content exposure to the global market will lead to virtuous cycle of character promotion followed by an increase in plush toy sales,” Yi wrote. Founded in 1981 and listed in December 2000, Aurora World has sold more than 80 million units in YooHoo & Friends plush toy line since its 2007 debut. YooHoo & Friends’ TV adaption was first aired in 2009 in Korea. 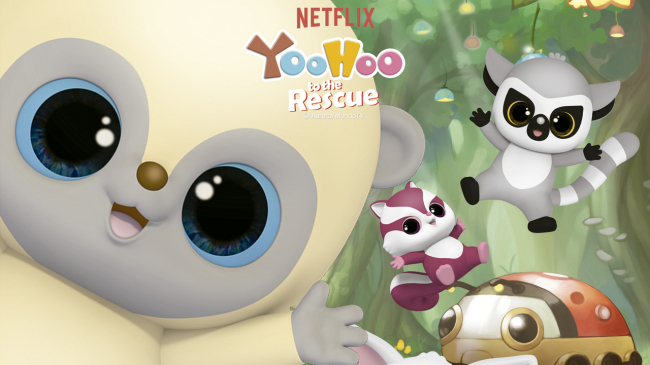 YooHoo & Friends revolves around a quest of five animal characters based on endangered species -- YooHoo, Lemmee, RooDee, Pammee and Chewoo -- to save their habitat called Yootopia by fighting external threats like pollution or human villains. The success of the plush toy line and the animated TV show allowed Aurora World‘s overseas expansion. The company has international sales corporation in the United States, Europe and Hong Kong, and has production facilities in China and Indonesia. Aurora World’s yearly revenue more than doubled in eight years, from 70.3 billion won in 2009 to 143.6 billion won in 2017. As of the first quarter of this year, some 79.7 percent of revenue came from overseas. This, at the same time, puts Aurora World to foreign exchange headwinds. Yi of KB Securities wrote that a recent strengthening trend of dollar against the Korean won will become a bane to the company, while adding the impact from it is likely limited because of the company‘s own maneuver to hedge forex risks. Moreover, major sell-offs this year by institutional investors -- including Shinyoung Asset Management and Allianz Global Investors -- had weighed investor sentiment, Yi added. Aurora World recorded the third-largest yearly net profit in 2017 among all plush toy makers in business in Korea, following Heng Sheng and Youngtoys, according to data compiled by Korea Investment & Securities.